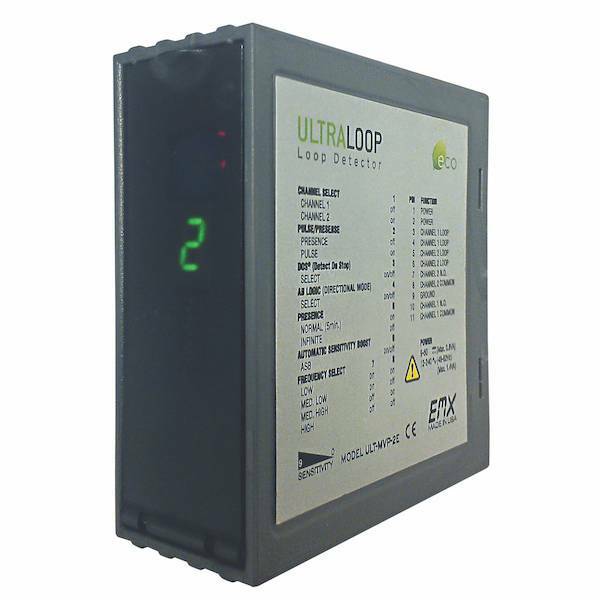 The ULTRALOOP™ ULT-MVP & NEW ULT-MVP-2 (two channel) Multi-Voltage Vehicle Loop Detectors combine small size with 9VDC to 240VAC input range. The ULTRALOOP MVP series loop detectors are equipped with our new DETECT-ON-STOP™ or (DOS®) feature, which allows detection only when a vehicle has to come to a complete stop on the loop. This exclusive feature is unique to EMX, and is a major advantage if you want to ignore cross traffic in tight spaces.